This is my pack. 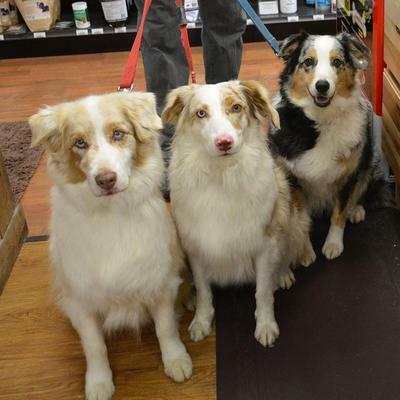 Starting from left to right is Bandit, he is a red merle and 13 years old, followed by Comet who is also a red merle and 2 1/2 years old. He just might make it to 3 if he's lucky. LOL. Last is Mysty Bleu my blue merle female, she just turned 6. These are my best camping and living companions. I can't say enough about them, they are very popular in the city of Cleveland. People walk by my house and tell me they make it a point to stop by and see them. When I am out and about everyone wants a picture of them or with them. They always remember their names and forget mine. I can't say enough about them except this. If God created a dog batter than an Aussie, he kept it for himself.